You like to travel from Lovina (North Bali) directly to Lombok or the Gili Islands (Gili Air or Gili Trawangan) - or also the other way round? The transfer takes about 2 hours. There is no public transport from Lovina to Amed in the morning (Perama o.ä. ), hence private transfer is necessary and should be included in the ticket price. 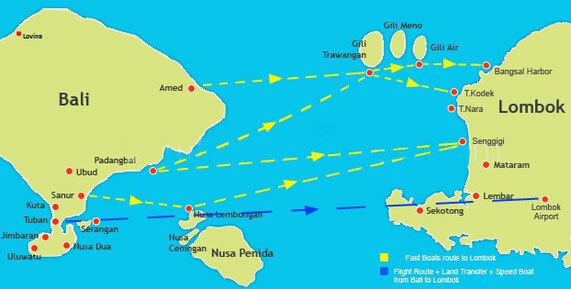 There is no need to book a speed boat from Trawangan or Air to Meno (120.000 IDR), as the ride is only 10 minutes between the islands. Afer your stay on Gili or Lombok, you plan to come back to Bali? Buy a return ticket (sometimes also open return possible) as the tickets are much more expensive on Gili! During the high season (July - September), make sure to buy your ticket at least 2 days in advance. Off season also possible one day before. Buying in Bali from a local agent is much cheaper than online from the speed boat companies! Make sure the agent is indicating his email and phone number on his tickets in case you like to make later changes. Schedules and Punctuality: The boots will never leave before the given time - however sometimes (much) later. 30 to 45 minutes are concidered as being "normal" delay. This is Southeast Asia guys, a strict western timeline is mostly unknown here. Just assume there is a reason... So don't get nervous if there is a delay and go enjoy the time with the other travellers waiting!! The fabulous fact: Your connecting transfers will always be guaranteed as the drivers are not wating for "Alex at 11 am" but for "Alex from the boat from Gili T". Means, they are waiting until the boat from Gili T has arrived - and if it's 3 pm. So no need to get nervous or try to call somewhere to inform about the delay. We deeply recommend NOT to go back from Gili at the day of your departure!!! Apart from relatively minor delays talking above it is possible you face tremendous delays due to weather or water conditions! In rare situations, the boats cannot run for one or two days - so the operators re-direct you to the Lombok ferry what takes 6 - 7 hours to reach Bali. Better don't take a risk and spend the last night before your return flight in Padangbai, Sanur, or Jimbaran. Like to make a pre-booking for your ticket? For price or booking requests, please use the booking form on our website or write an email or whatsapp. We are not able to reply to blog comments for technical reasons.